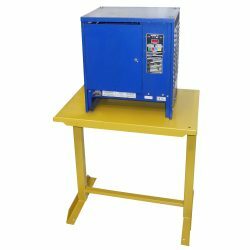 BHS Charger Stands provide a dedicated location to safely and conveniently store forklift battery chargers while providing sufficient access for maintenance personnel. BHS charger stands are built to withstand harsh environments and keep forklift battery chargers elevated and out of forklift travel paths. Pre-cut anchoring slots make it easy to secure chargers in all four corners. Smooth, rounded corners on the shelf help extend product longevity. All aspects of BHS charger stands were designed to improve battery room efficiency and productivity. To suit all types of chargers and requirements, BHS offers a variety of other charger mounting stands and brackets, as well as cable management accessories designed for use with charger stands to properly route charger cables. All stands have mounting holes on both sides for BHS Cable Retractors. BHS charger stands are constructed from heavy-duty steel for extra durability. All models can hold up to 400 pounds, and optional 6-inch shelf extensions are available for maximizing the space between stands. These stands are designed to integrate seamlessly into a battery room and facilitate an uncluttered and efficient space. Custom-built models with unique specifications are available upon request. Contact our sales team at 1.800.BHS.9500 to learn more about heavy-duty charger stands. * CS-KDF models are bolt-together design and shipped unassembled to reduce freight cost when ordered in bulk. Assembly hardware and tools included.